Over 70.000 geocoded hotels have been added to the geonames data base. This new hotel data is provided by various hotel booking systems. So far geonames.org is working together with three hotel booking systems : hotels.com, diytravel and laterooms. Data from other providers will follow. 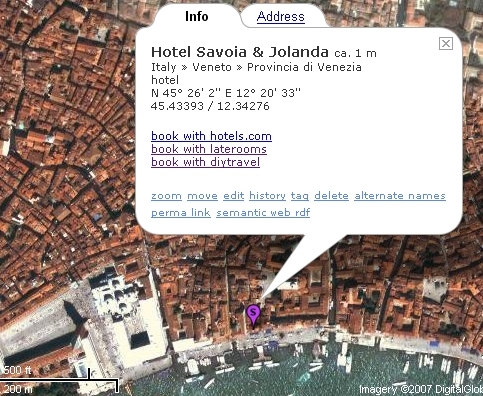 The information window displayed on top of the map or satellite view has gotten a new tabulator with the hotel address. The address information is also available for other points of interests like the recently added Raiffeisen Bank branches in Switzerland. Included in the daily geonames dump are the name of the hotel, latitude, longitude and all other information available for geonames toponyms. Not yet included is address information. The hotel data addition is part of an ongoing geonames initiative to make more Points Of Interests available. The challenge in this task was to integrate and match data from various data providers. Names and addresses of hotels as well as data quality may vary dramatically among providers and it is often difficult to figure out whether two hotels are actually the same hotel or not. And all of a sudden, also 70,000 hotels in Tagzania, as well as at the sites of other users of Geonames… Thank you! Have you got any plans to expand the geonames hotel service? sletoh.com is a hotel price comparison site and we would like to give you all of our hotel data to add to geonames. Thanks a lot for your offer. At the moment we have not timeline planed for an expansion of the hotel service. When we do so we will certainly come back to you. Thanks again. The download link for the full file (allcountries.zip) seems to be broken.